German Shepherds are one breed prone to bloat. Bloat in dogs is a swift, life-threatening condition that can kill a dog within hours if left untreated. Even when an owner does suspect a case a bloat and contacts a vet immediately, the prognosis is often grim. Learn more about bloat, how it's treated and which measures you can take to try to prevent it from happening to your pet. The scientific name for bloat in dogs is actually gastric dilatation-volvulus, but most dog owners and vets simply refer to this condition as "bloat" or "torsion." In a case of bloat, a dog's stomach will suddenly begin to fill up with gas and fluid. This puts a great deal of pressure on the veins in the region which, in turn, interferes with the flow of blood to the heart as well as to the stomach organ itself. As the stomach inflates, it begins to twist. This eventually cuts off the blood supply to the organ, and it also closes off the stomach's entrance and exit points. The gastric juices as well as any partially digested food present are all trapped in the stomach, and this leads to further fermentation and gassy buildup. Organ failure sets in within a matter of a few short hours after onset, and the dog's death is not far off once that happens. Since bloat in dogs is so deadly, it pays to have a good understanding of the symptoms dogs display. However, it's still not easy for the average dog owner to determine whether a dog has bloat or just a bad case of indigestion until the situation nears the crisis point. Time is against a dog suffering from bloat, so it's crucial to recognize the symptoms and seek veterinary help immediately. Call your vet or your local emergency vet if it's after regular office hours, and let the receptionist know that you suspect your dog has bloat. Drive your pet to the vet as quickly as you possibly can. Treating bloat is very difficult even under the best circumstances. If the condition hasn't progressed too far, the vet may be able to pass a tube down the dog's throat and release some of the pressure in the stomach. This can restore some of the blood flow which helps the stomach as well as the heart. Usually, this allows the vet to stabilize the dog enough for surgery, although the vet will typically take an x-ray to get a clearer idea of what's happening inside. During the surgical procedure, the vet will get a closer look and determine whether the dog can be saved or if the damage is too extensive for the dog to survive. If the vet feels the dog can recover, he'll try to gently untwist the stomach and remove any dead tissue that is evident. Once this is accomplished, the vet will use stitches to tack the stomach to the abdominal wall in an attempt to keep it from twisting again in the future. In most cases, the dog will remain in intensive care for a few days so the vet can monitor the dog's progress and watch for post surgical infections and other complications. Now that you have a general understanding of bloat, it's time to take a look at which dogs are more likely to develop the condition. Vet's don't yet know exactly what causes bloat, but there appears to be a genetic predisposition for bloat, as well as some physical factors that may create the ideal conditions for bloat to occur. The condition seems to develop most often when dogs either eat a large meal or drink a lot of water and then follow up with a lot of exercise. It could be that dogs gulp more air under these circumstances, and that air becomes trapped in the stomach and sets the torsion process in motion. Since bloat can develop so quickly and leave an owner with little time to seek help, prevention becomes even more important. Here are a few things you can do to lower your dog's risk. Instead of feeding one large meal a day, break that serving into two or three smaller meals spaced evenly throughout the day. This reduces strain on the digestive system that could play a role in developing bloat. Don't feed your dog when he seems anxious or overly excited because stress may play a role in bloat's development. Give your dog a couple hours of rest after a meal before you allow him to exercise again. Never switch your dog's food abruptly. 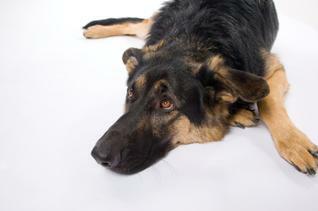 All dietary changes should be made gradually as you observe your dog for any signs of distress. Keep fresh water available at all times except right after a meal. It's very difficult to save a dog once bloat sets in, but some dogs do recover if they receive treatment before too much damage is done. Perhaps the most important thing to understand is that a dog that has bloated once is likely to do so again at some point in the future. Anchoring the stomach to abdominal wall is an important step in preventing a recurrence, but there's no guarantee that the stomach won't break free and twist again.